Billiards is one of the most popular games in the world, and for good reason – it’s fun for all ages and can provide hours of fun. No matter what level of player you are, there’s always something more to learn. From an amateur playing at home to a professional entering tournaments, there are always tips and tricks to help you improve your game. Here are some of the top tips you can try to improve your billiards game today. One of the biggest mistakes that new players make is shooting the ball without strength behind the shot. That means focusing on your stance. Put one leg forward and one leg slightly back, and slightly bend your knees to anchor yourself to the ground. Use your shoulder muscles as well as your arm muscles to firmly strike the ball. When the ball isn’t struck correctly, the cue can slip on the ball and cause it to go in the wrong direction. Practice standing with your feet firmly planted as well as striking the ball without moving. An incorrect stance is one of the most common causes of mis-hits on the ball. Take your time to line up your shot properly. The worst thing you can do for your game is rushing your shot. By taking your time to line up the shot and get your stance right, you’ll have a much better game. Unless you’re in a professional tournament, you shouldn’t be timed between your shots. Take as much time as you need to feel comfortable and confident with your shot. If you want to get consistently better at pool, try to leave your next shot as an angled shot rather than a straight shot. If you keep setting yourself up for straight shots, you’re really limiting your options on your shots. 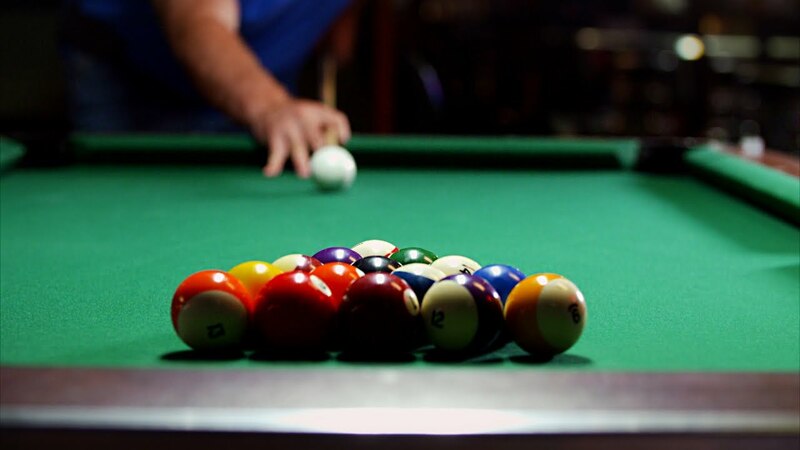 Practising your angled shots will give you more options when the cue ball ends up somewhere you might not want it to. We aren’t talking about randomly shooting the cue ball around the table to try and make one in – the best kind of practice is structured. Set up the billiards balls in different scenarios and try to work your way out of them. There isn’t much use in shooting the balls in one after another with no direction. Set up goals of what you want to improve on, whether it’s breaking, angled shots, or planning out consecutive shots. There’s nothing more effective at improving your billiards game than playing people who are better at the game than you. You can learn a lot about billiards by playing those who have been playing the game for a long time. You’ll pick up tips and tricks that you might not have known and can have them show you how to improve your play during the game. It’s fun to win, but you won’t learn as much by playing people who are always worse at billiards than you. Finally, you need to play on the right table. Playing billiards on a low-quality table can have a big impact on your game. A way to be certain that you’re playing on the right table is to play on a table from T&R Sports. We only stock high-quality tables that meet our rigorous quality standards. We know how important it is to play on a good billiards table, and wouldn’t sell you anything less than the best. Check out our stock of billiards tables online or come in to see the team today.